Cobblers boss Chris Wilder has confirmed that he is ‘not a million miles away’ from making his first signings of the summer. Wilder says that he and assistant Alan Knill are ‘well down the line’ in talks with four players that were their main targets to strengthen the Cobblers squad. 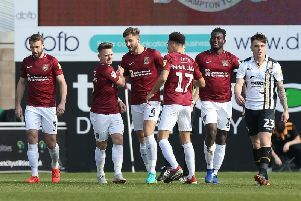 The Cobblers currently have 14 players contracted for next season, but that number is effectively 10 as John-Joe O’Toole and Chris Hackett have been transfer-listed, and Wilder is expected to loan out teenagers Danny Clifton and Sam Warburton to get experience of senior football. It means Wilder has plenty of work to do over the summer to bring the squad number up to the 21 or 22 he says will be ideal, but he is confident he will soon be able to unveil his first new signings. “We are meeting players, we have met three or four, and we are not a million miles away from announcing a couple,” Wilder told the Chronicle & Echo. “Obviously like everything else, those players have to weigh up their options as well, but we are quite active. “It’s a little bit different to last year, because we have the nucleus of the side that played from Christmas onwards under contract. “That means we are not in an unbelievable rush to get things done, but we are down the line on four players. And he added: “The ones we are talking to are the targets we had in mind. “We are hoping that, fingers crossed, the ones we have identified that we can get them. “We are not always going to be guaranteed that, but we will have a good go at them. “We have had the players down at the ground, and showed them round. We have spoken to them and met their agents.